People love to talk. I’ll be the first to admit that I’m definitely one of those people, whether I’m talking your ear off about classes or complaining about the weather. But my favorite thing to talk about? Shopping. If I get a fabulous deal on sweaters during a fall clearance event (with free shipping!) or buy a pair of boots that I really like, I’m going to tell you. Even though you might not like when I babble relentlessly about my shopping conquests, I can think of someone who does: advertisers. That’s because when I rant about how much I love a product, brand, or when a store is having a sale, it’s instant, free, word-of-mouth marketing for the company. While me talking to you about my shopping adventures is natural and not sponsored by a company, marketers are increasingly pursuing tactics that take advantage of marketing in forums that are “not TV ads or billboards, or even video games, but rather the conversations we have in our everyday lives,” as described by Rob Walker in “Buying In.” Walker describes such word-of-mouth marketing techniques as an attempt to “break the fourth wall that used to separate the theater of commerce, persuasion, and salesmanship from quotidian life” through “the commercialization of chitichat.” There are even companies out there, like BzzAgent, that recruit “agents.” These everyday people volunteer to talk about a product with friends, co-workers, or neighbors using specific talking points provided by the company. Even if we aren’t recruited by a company like BzzAgent, we can be “agents” naturally, without even realizing it. Unless you are the most spacey person in the universe, chances are that is going to stop you in your tracks. What is that exactly you might wonder? 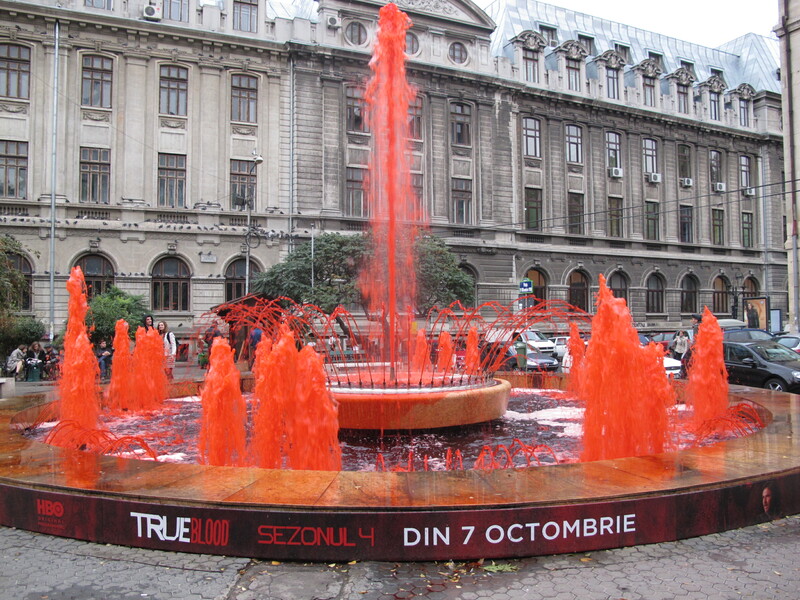 Well, as the band along the bottom of the fountain indicates, it is an advertisement for the fourth season of the popular HBO show, True Blood, which debuted in Romania on October 7. While that strip of print advertising is by no means novel, it’s the huge blood-red stained fountain above it that I want to draw your attention to. In my opinion, that’s one pretty awesome form of murketing. 1) By stopping pedestrians in their tracks, it encourages them to read the band of print advertising under it that would most likely go unnoticed under normal circumstances. 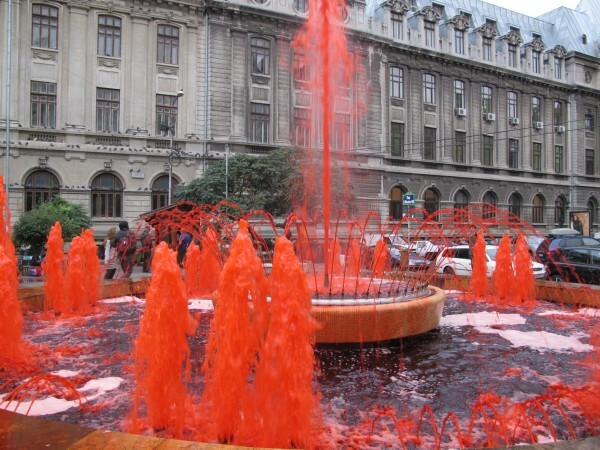 2) If you see a red fountain in the middle of town, you are probably going to tell your friends. Something like that needs a lot of explaining too. So, a typical conversation will probably have the mention of True Blood in it to explain what the heck happened to that fountain. Boom. Instant word-of-mouth advertising. Does anyone else feel bad for the guy who has to clean that up? I do. In your homes?! In your schools?! Coming to an inbox near you!